Deals on Wheels caught up with Iain Forrester of Forrester Logging on a wet winter’s day in the Waimatenui Forest. Being stuck inside an office can sometimes be a bit of a drag. But there are days when it’s actually really appealing. Like when the alternative is being knee-deep in mud, in driving rain, in the middle of a forest, surrounded by noisy machines. But that’s exactly where I found myself earlier this month when I met with Iain Forrester and one of his logging gangs deep in the Waimatenui Forest. 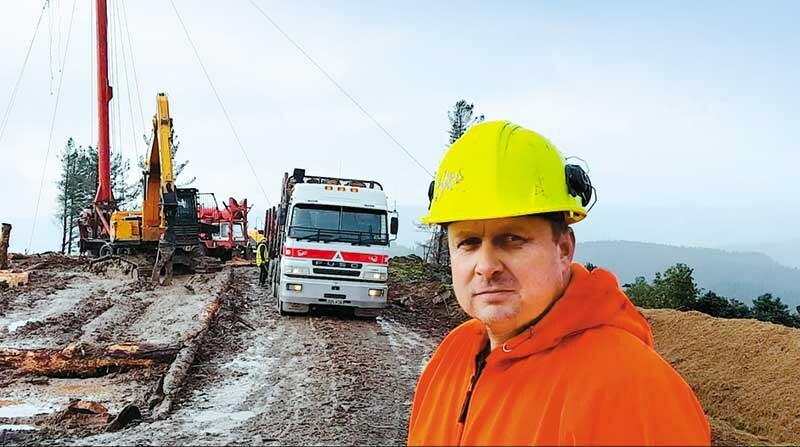 Born and bred in central Otago, Iain took on a temporary logging contract in Northland in 2012. Four years on, he and his family now call Kerikeri home and are enjoying the relaxed lifestyle and warmer climate. After driving trucks for a living, Iain began his logging business in 2005. A little over 10 years later, Forrester Logging runs four gangs, with around 34 staff and 38 machines. Iain explains that the forestry opportunities in Northland meant moving the family to Kerikeri was an easy decision to make. "Business-wise it’s fine. It’s also a good community and the kids are loving it here," he says. Forrester Logging is predominantly hauler logging, with three 90 foot towers. 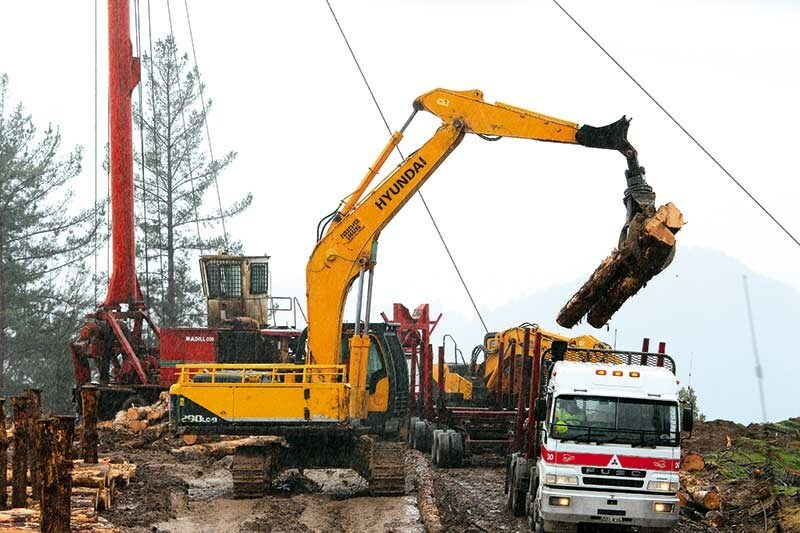 Unlike ground-based logging where the extraction machine drives over the cutover to collect a load, hauler logging is more suited to steep terrain and involves the extraction of logs to a landing point using a fixed hauler with steel ropes. "When you’re hauling, you’re solely governed by how much wood the hauler can pull up the hill. If any part of the operation doesn’t work, or doesn’t offer value for money, the costs quickly add up – and they’re pretty significant," says Iain. 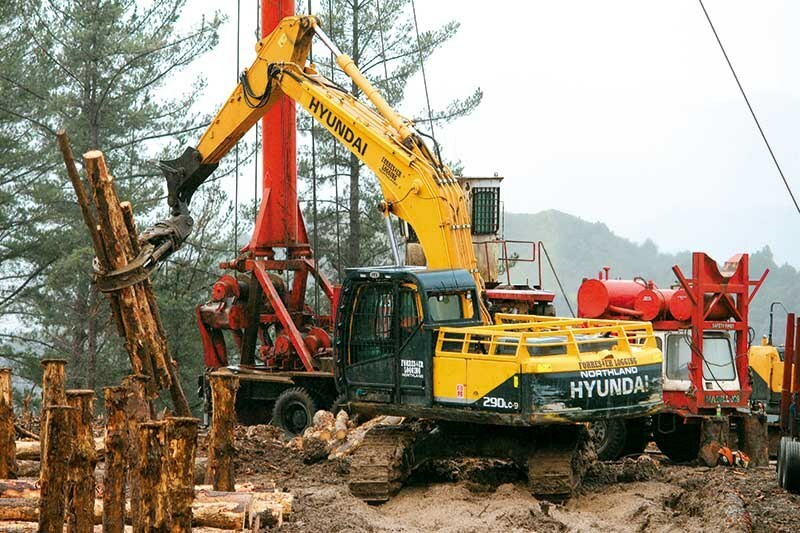 Iain says that in terms of value for money, the Hyundai excavators he purchased from Porters Equipment hit the mark. 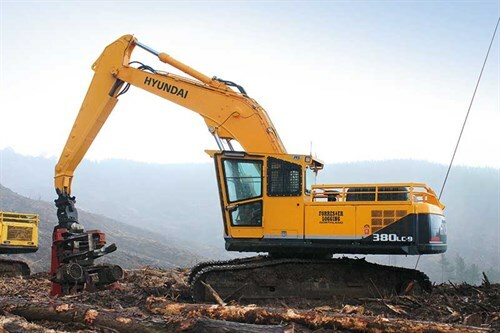 "We’ve been using Hyundai R290LC-9 H/C and R250LC-9 H/C machines for about five years now and have just taken delivery of a R380LC-9 and a R290LC-9 H/C. 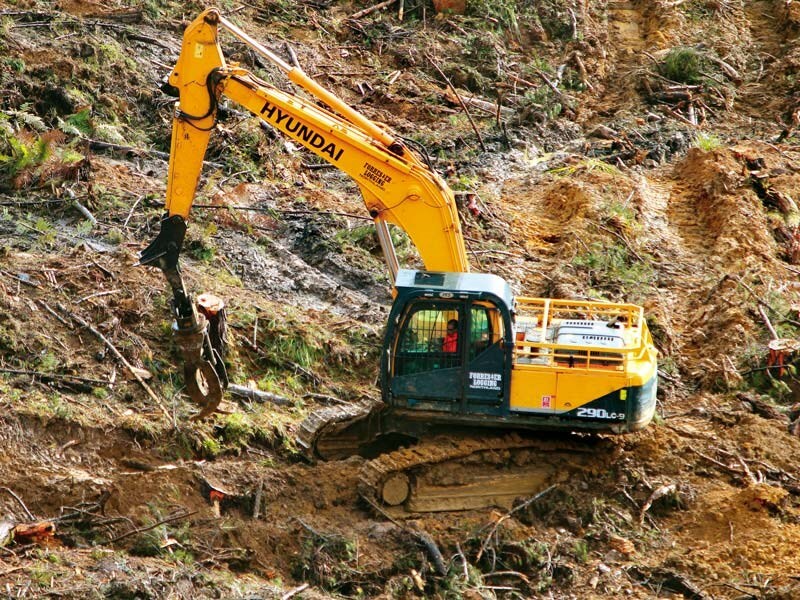 The guys are really happy with the Hyundai machines – they’re comfortable to work in and have plenty of power. 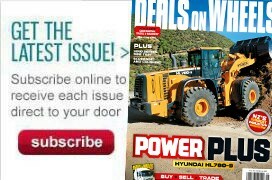 "When it comes to purchasing machinery, it’s all about cost per tonne – what it costs to pull wood and cut it up. Obviously you’re also taking into consideration the longevity of the machine, fuel efficiency, and driver comfort and safety. The Hyundai machines tick all those boxes. The decision to use them just makes good business sense for us." Both the Hyundai R290LC-9 H/C and the R380LC-9 offer operators a number of safety features including high strength steel in the cabin, safety glass windows on all sides, excellent visibility from the cabin, as well as plenty of space and comfort to minimise operator stress. Iain’s F7 crew sends out around 300 tonnes of logs each day in pretty tough conditions. And it doesn’t get much tougher than mid-winter after days of solid rain. The ground quickly turns to mud and the temperature drops down to some bone-chilling lows, particularly first thing in the morning. "It’s not an easy job these guys do," Iain says. "For some it means getting up for work at 4am and putting in long days, five days a week. And not just my crew. Across the country round 25,000 guys get up at 4am to travel and start work at 7am. Iain gives me a quick overview of the site’s safety procedures. Take my word – it’s unbelievably comprehensive. And something that he is very passionate about. "I believe the forest industry leads the way in health and safety, especially in drug and alcohol testing. The rest of the country is really only just catching up to the standards we’ve had in place for years." 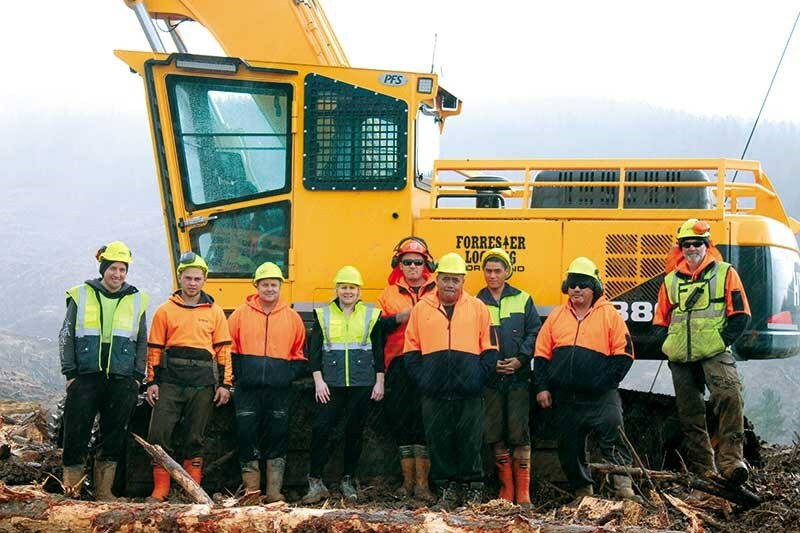 Waimatenui Forest is managed by Northland Forest Managers (NFM) for Greenheart Group who grow sustainable forestry assets around the world. The group is committed to finding balance between meeting the demand for wood and preserving the environment, including respecting the local heritage and culture. "The values and vision of Greenheart aligns well with our business values," says Iain. "The land we work on has some significant cultural sites and it’s important to us that those areas are cared for and preserved." Iain admits that the forestry industry isn’t for everyone. But for those who relish the challenges it brings, the job is extremely rewarding. "It’s a tough gig, but the vast majority of the guys and girls who do the job are really passionate about it. Every one of them is a highly skilled professional who play a key role in Northland’s economy," he says. "For them, it’s very rewarding putting in a good day’s work and being surrounded by people who care about doing a good job and who care for the people they work with." HireWays is a rental company in the lower North Island experiencing rapid growth for a good reason.